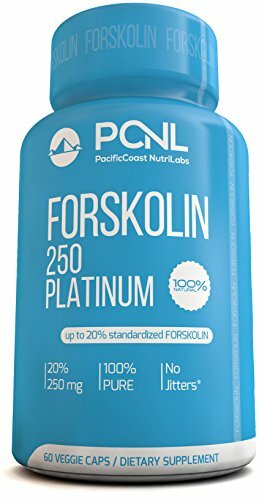 PLATINUM SERIES: Pure 250 mg Forskolin (coleus forskohlii root extract) standardized to 20% for 50 mg Forskolin in each pill. 4X's more effective than 125 mg, 10% standardized formulas. FULL 2-MONTH SUPPLY: With each pill yielding the highest Forskolin potency available, you get a true 2-month supply. Others require 2 or more pills to meet the amount of active Forskolin in only one of our veggie capsules. HIGHEST MANUFACTURING STANDARDS: Manufactured here in the USA in an FDA approved facility in accordance with strict GMP standards, you can trust that you are getting the highest quality Forskolin on the market. BONUS EBOOK: When you order today, you'll also receive our exclusive eBook, The Forskolin Formula, absolutely free. This is a $19.99 value that you receive simply for trying our product. Unlock the secrets of Forskolin. DR. RECOMMENDED: A noted celebrity doctor deemed Forskolin the key to his, "Rapid Belly Melt" weight loss plan. He explained that Forskolin acts a "furnace" burning belly fat from the inside out, creating a toned belly. Forskolin stimulates the production of a molecule called cyclic AMP. Cyclic AMP is responsible for facilitating the communication between our cells. When there's an increase in cyclic AMP, it allows our cells to increase the production of a hormone called sensitive lipase, a hormone responsible for burning fat. Cyclic AMP is also thought to stimulate the release of the thyroid hormone, another hormone that helps in burning fat. In short, Forskolin stimulates the production of fat-burning enzymes that in turn, burn fat and lead to weight loss.